Bests Free Online Lightroom Web Based Alternative. All free online photo editor Lightroom alike alternative in the web browser. The best free online Lightroom photo editors web based alternative are listed below which are able to do what Lightroom does, but for free. For the moment a lot of them cannot handle RAW image, very few do though, but those free online photo editors alternative to Lightroom will do a good job on your JPEG photos and some even better than Lightroom. 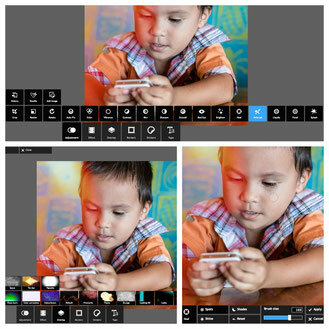 1) Pixlr Express an easy to use free online photo editor. 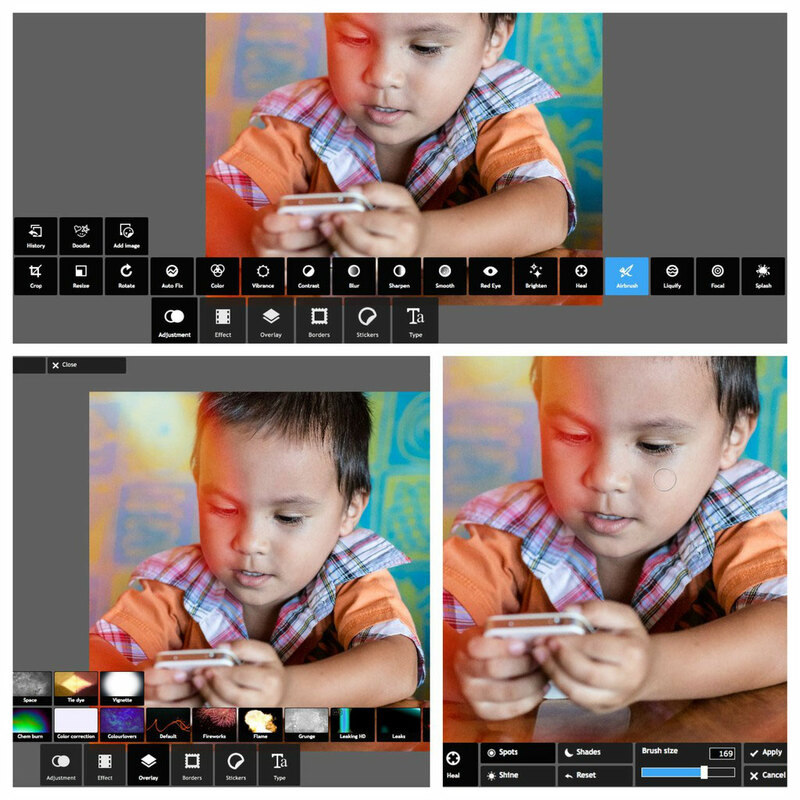 Pixlr Express is more oriented for a fast editing, but with all editing tools you will need to edit properly pictures, like the white balance, the sharpness, exposure, Pixlr is also featured with brushes and a lot more. It is also limited to 4000 pixels like his "brother" the "Editor" edition when you want to save your work.
. Pros : No upload needed, beginners and advanced photographers friendly, a lot of filters, textures and special effects, frames and borders, stickers, all the basics photo adjustment tools, can blend different pictures together with opacity option, doodle brush eraser, heal tool, all the image editing basics (exposure, color, saturation, etc...), different brushes effects, airbrush to smooth the skin and wrinkles, text effects, collage.
. Cons : No RAW image support, save your pictures at 4000 pixels at the widest. 2) PixlKit the surprisingly good and fully tooled free photo editor. PixlKit was a very good surprise among those all Lightroom look alike tooled editors. Pixlkit has also the famous "content aware fill" tool to replace whatever you want with the surrounding pixels, when you click on the "Menu" you got a bunch of options and tools, but let the user interface quite clean, so you will never be overwhelmed, Bravo Pixlkit! Cons : No RAW file support. 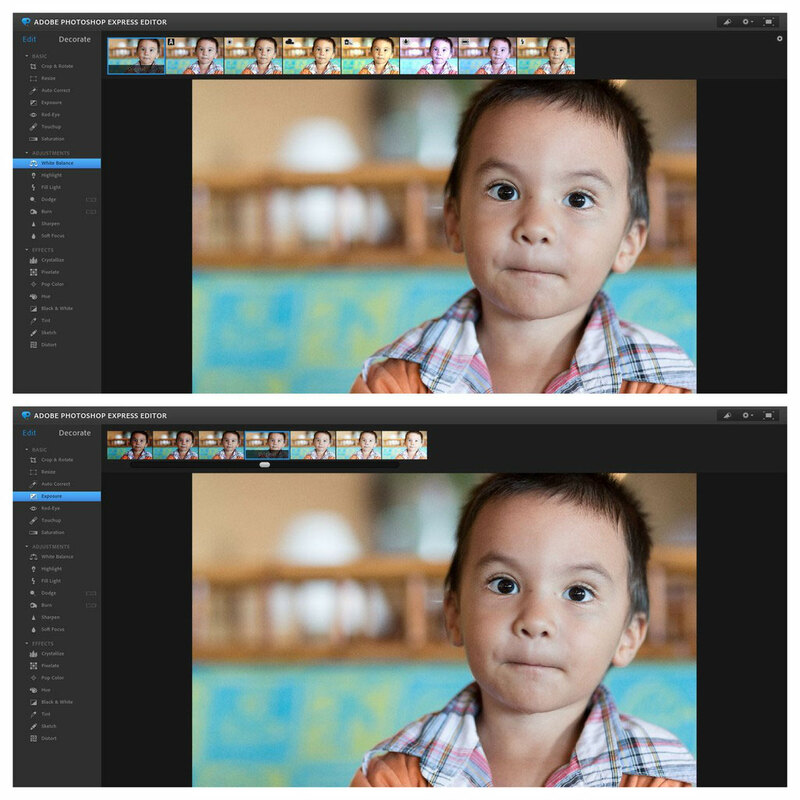 3) Adobe Photoshop Express free JPG (only) online editor. Adobe Photoshop Express, Yes it is from the Adobe company who does the real Photoshop. First at all i should say , it does not look like Photoshop at all, and it is a lot more user friendly. This online free Photoshop has improved in the last few months, Adobe added some sliders to fine tune up a photo and deserve to be called a photo editor, although it is not perfect yet. Like i said above it is very user friendly, very easy to use, aimed to the novice as well as the more advanced beginner photographer who want in few clicks edit and share a picture online. It have some interesting tools like the dodge and burn (still in beta at the time i am writing these lines). I regret some limitations, like when i save my pictures (we cannot control the JPEG quality nor the size), although the quality is more than good enough. Pros : Easy to use, quick and fast, automatic preview, no upload needed. Cons : JPEG support only, import 16 MB max, white balance very limited options, need to re-open the photo editor after each saved picture, save your pictures at 2048 pixels max at the widest, no saving options, miss some fine tuning sliders on some tools. 4) Polarr 2 RAW photo editor and converter Lightroom alike. Polarr 2 is the second generation of Polarr photos editor and RAW converter (yes it does RAW too), and it might be actually the best alternative to Lightroom, or even better, on the web. It's layout is so similar that even a double click on the sliders will reset it at it's original place. Like Lightroom it have the radial filter, the graduated filter, the same basics like the tone curves, HSL, split toning, details, effects and even some presets (on the left)! So it is not really aimed to the beginner, but the latter can learn a lot about demosaicing with it. Plus, you can save your work at the original size. An incredible excellent free online Lightroom alternative. One of the best part is that Polarr will recognize your computer when you will go back few weeks later (with the same computer), and automatically reload your last session with your pictures and theirs historic, Bravo! Pros : Like Polarr1 it's a RAW photo converter, no upload needed, save your pictures at the original size, it look even like a true Lightroom free alternative , have more presets and styles than Polarr 1, before and after preview, denoiser tool, local adjustment editing and radial filter. Cons : Less tools about the lenses correction and distortion than Polarr 1. No more text to watermark your pictures, no clone tool. 5) Polarr 3 RAW photos and images editor in the browser. Polarr 3 handle RAW image like all the Polarr edition and has a totally new redesigned user interface. It does not look anymore like Lightroom, but you will not feel disorientated, it have all the photo editing tools of Polarr2 with a slightly different user interface. On Polarr 3 some photo editing tools are now a paying option like the gradient and radial mask and some filters. Like it's brother Polarr 2, it has the radial filter (but as a paying option on Polarr3), the same basics like the tone curves, the graduated filter (also a paying option on Polarr3), all HSL, the split toning, denoise (amazingly good) and sharpness details, some effects like vignette and a lot more. Pros : it's a RAW photo converter, no upload needed, save your pictures at the original size, Nice graduated sliders, have few presets / styles, better place for the before and after view button, excellent denoise, local adjustment editing and radial filter, possibility to mix your edit with the original. Cons : no clone tool, some tools are paying option like the graduated and radial filters. 6) FotoFlexer free online photo editor and image effects. The FotoFlexer website photo editor is not a RAW compatible. It is a flash made (not HTML5) it means if your browser is not up to date with the Adobe plugin you might got an alert, also it needs a true upload of your photo on the website. 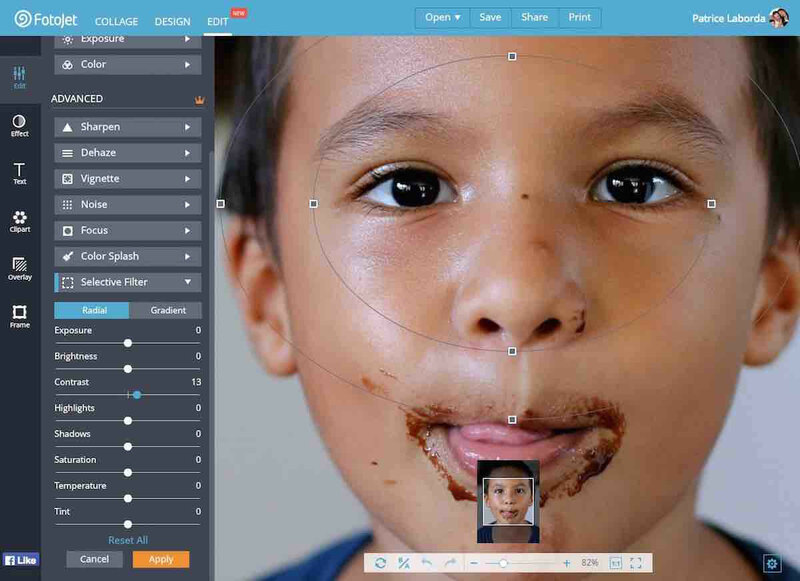 FotoFlexer will automatically shrink your picture to a max of 2240 pixels at the widest. The quality of the saved JPG is very good, i have nothing to criticize about that, but if you have a slow internet connection and many pictures to edit, you might get angry because of the need to upload to the server and then it download to your browser. For your own website, FotoFlexer has an API that you can upload on your website if you're interested to offer this free online editor to your visitors. Having said that, Fotoflexer has some specific editing tools you might fall in love, like isolating the subject from the background, blending many pictures together, decorate, a bunch of filters and borders, frames, animations, effects, distortions and so on. It is a bit limited with the basics tools, for example there is no straighten tool (unless i didn't find it), It has also full screen ability. Pros : Easy to learn the friendly user interface, it is organized by tabs, it has the very basics editing tools, many photo filters and layouts, it support multi blending images, it has stickers, text glitters effect, you can draw, cut some parts like the background, make cards, animated stickers, fix blemishes and wrinkles on the faces, sharpen and smooth, distort pinch stretch and squish, some brush tools, it can work with layers and a geek tab for morphing and curves, frames and borders. Cons : No RAW support, upload AND download needed, saved image at 2240 pixels at the widest, no straighten tool, Adobe flash dependent. 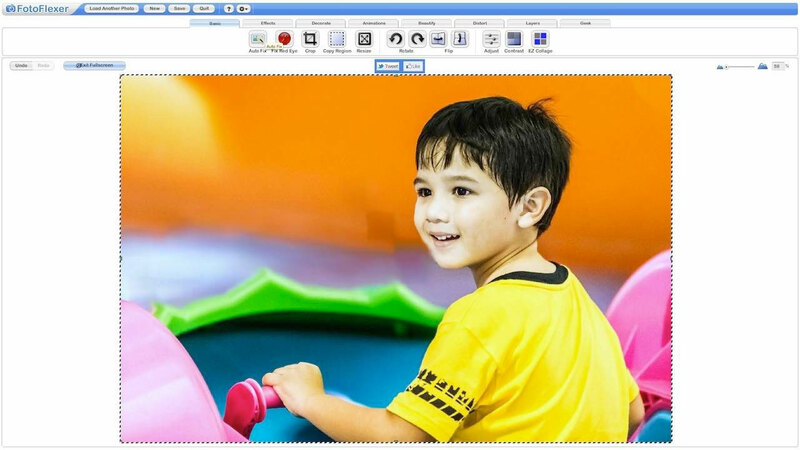 7) FotoJet free online photo editor easy to use. The FotoJet website is improving year after year, and it's a very good news for us, fanatic of free online photo editors, because FotoJet just get its own online photo editor! So, I'm sure you're thinking: But what FotoJet has that other free online Lightroom alternative don't have already? - Radial and Gradient filters (located in "Selective Filters") for free and not as a premium option (Oh surely one day not anymore, I see very well those crowns becoming a premium option instead of just a free sign up though, but for the moment it's free, so if you sign up with Facebook or by email, for free, you will have access to those photo editing tools). We would like more tools in the selective filters, like denoise, sharpening and clarity, but hey they just start with their photo editor, let them the time to add more tools. By the way, FotoJet put the clarity tool in the "Sharpen" tab, and you know what? for me it does make sens, finally! but i know many photographers who are... so blindfolded. Pros : Easy to use, aimed at the beginners, no premium options(it's all free), radial and gradient filters to edit locally on a picture, text and watermark, photo effects, tilt shift (miniature effect), frames and borders, stickers, collage, cardboard, clip arts and overlay. Magnify a photo with the scrolling wheel on the mouse (just very few online photo editors have this nice possibility). I want to add that they just started with an editor >> i am sure many more tools are on the way to surprise us, so stay tuned with FotoJet. Cons : No RAW support, automatically resize your picture at 3200 pixels max (it's not bad, but once you've cropped and straightened your picture, there is not so more left, let extend it for, at least, 4 000 pixels), no denoise tool or blur tool(to blur locally if no denoise tool), no clone tool or blemish and mole removal or a even a spot healing brush, Adobe flash dependent.